Get data in the cloud from a NexSens iSIC or SDL through iChart. The logger pushes its data to a web enabled computer running iChart which will upload the data to WQData LIVE. 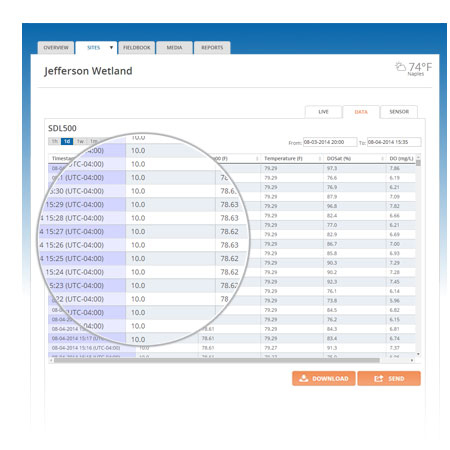 Data viewing, alarms, and reports can all be done from anywhere through WQData LIVE. Upload data straight to WQData LIVE from the field over wifi, cellular, or satalite. 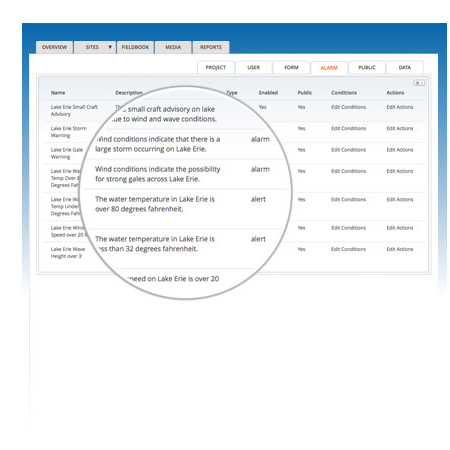 Remotely manage logger settings from the cloud. 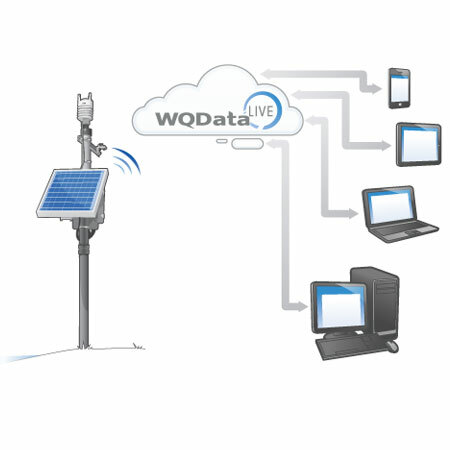 Troubleshoot logging and data reading issues from anywhere through WQData LIVE. In the near future, WQData LIVE will be compatible with other web enabled data loggers. Simply set up the logger and add it to a WQData LIVE account and access the data from anywhere. 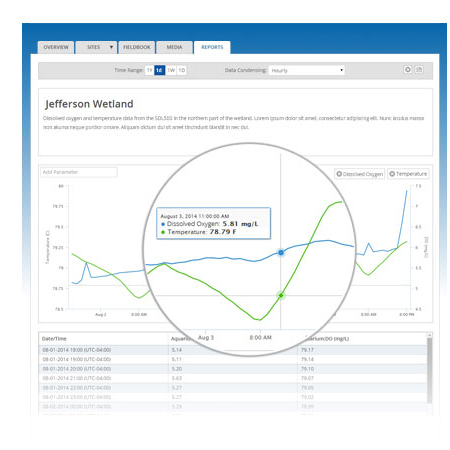 View the latest data readings from any site anywhere. 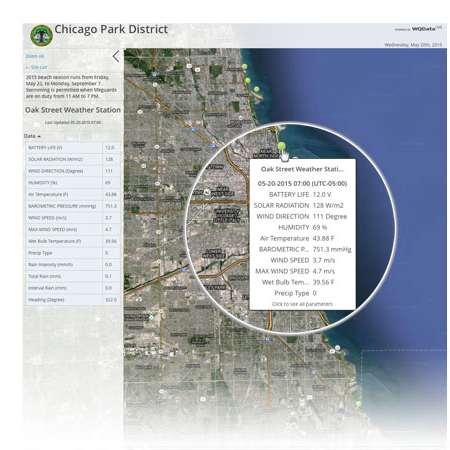 A map view provides shows latest data readings at site locations. Data history can be downloaded in CSV format. Open downloaded data directly in Microsoft Excel, Apple Numbers, Google Sheets, or any other spreadsheet program. Send single data sheets to anyone via email. Schedule data sending via email or FTP to send latest data to a server or collaborator. Use custom forms to enter manual data readings. Upload media and notes along side data readings. Share notes, data, and media with other project members. Have multiple people wokring on the same project and entering data into the same fieldbook from anywhere. Paperless! No more losing pens or pages falling out. Upload photos and videos from any computer. Media is stored securely in the cloud. 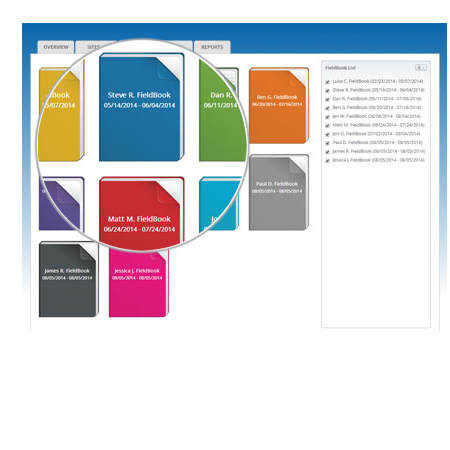 Sort media into albums or attach media files to a site. Search the media gallery by name or date. Set up as many alarms using as many conditions as needed. Alarm conditions can use parameters across multiple sites. Set up reset conditions to closely manage alarm states. Set up actions to specify who is contacted via email when an alarm occurs. Alarms can be made public and then subscribed to from within the LIVE Datacenter mobile app. Subscribers will recieve push notifications on their mobile device whenever an alarm triggers. Use preset time ranges for quick generation. Save report templates for frequent use. Generate reports with graphs and data tables of parameter data. Graphs can have 2 axis with a different unit of measure on each allowing comparision of data readings. Generate reports based on manually entered data. Generate reports of media uploads. Generate note reports to see time aligned series of notes. Note: WQData LIVE reports are still under development. Currently a limited amount of features are accessible. Contact NexSens Technology, Inc. for more information. 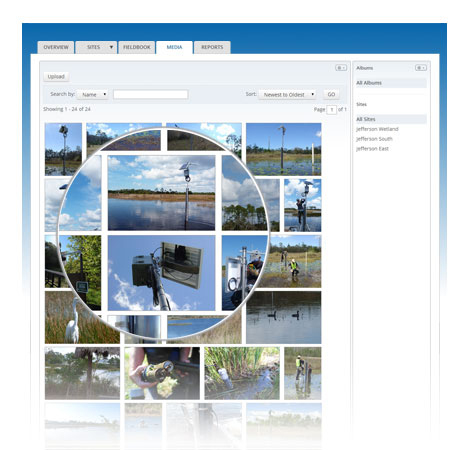 Set up a publically accessible portal for people to view project data. Map based interface shows site locations and latest data readings. Short data history is also accessible. Latest videos and photos are displayed as well as links to the full media gallery. The LIVE Datacenter App allows the public to view project data on the go. Public alarms can be subscribed to from the app to recieve push notifications for environmental conditions. Set up the web public portal and then enable the mobile version as well to show up in the list of LIVE Datacenter projects. Set up a web applet to be embedded into a webpage. Embed code is generated for quick copy and paste set up.